Hello and Welcome to the final day of previews and the November release for Sparkle Creations Rubber Stamps! 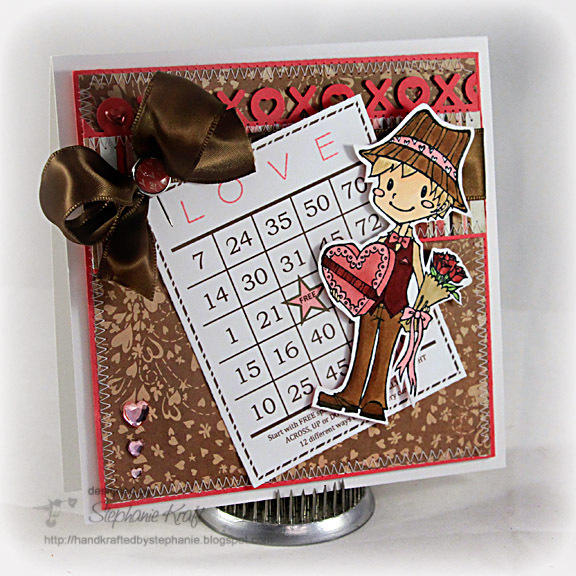 Sparkle is releasing 2 new images -- they are available in the store now.. Today we are previewing Valentine Oliver! Isn't Valentine Oliver the sweetest?! He has candy AND flowers for his Valentine! I paired him with some Basic Grey Bittersweet patterned paper. My bingo card was created by Sharon Harnist.. she generously has them available as a free download here. I printed the card, then I stamped the "LOVE" and colored in the "free" star. After coloring Oliver, I cut him out with a long rectangle nestability die, but it didn't look quite right on my layout, so I ended up doing some fussy cutting and popping him on top of the bingo card. Be sure to visit her and the rest of the SCRS designers for more peeks of Valentine Oliver. Sparkle will be giving away a Valentine Oliver to one lucky person! For a chance to win, you need to comment on all of the designer's blogs (list below). Then head on over to the SCRS blog and comment on the Oliver post. You have until midnight EST each day to comment. The lucky winner will be announced the following day! Accessories: XOXO border punch (Martha Stewart), Markers (Copic), Heart rhinestones (K & Company), Brad (Basic Grey), Bingo card (http://paperfections.typepad.com/), Heart trinket pin (Maya Road), Brown satin ribbon, Foam tape, Thread, Sewing machine. Love the image, and that chocolate bow, yummy! Well I think your cutting out the Oliver image worked very well. And I really like the bingo card! This is so cute! I love the Bingo card! Cute!! Love the bingo card! Love the fun layout! Doesn't this card just say "chocolate"? Great pairing of image and papers. Love this design and that bingo card is a perfect accent to Oliver! Love this color combo too! Wow, you did a fantastic job with him! That chocolate! WOW Looks great. Lovin what you've done here. Hi, really stunning card. What a wonderful layout and I love oliver cut out and popped up, absolutely stuuning with the big bow too! Cute,cute, cute. What a awesome and perfect combination of elements to go on this card! Beautiful card! Love the pink, white, and brown color scheme. Softly romantic without being in-your-face valentine themed. I love Oliver, too! I'm planning on a purchase after Christmas is over. I just found Sparkle Rubber Stamps during the Shop-Mart blog hop. Fabulous Stephanie! I finally found you! You often leave a comment on my blog, but not your blog addy. I found you on Mercy's blog...what a treat it has been visiting your blog...what inspiration I have missed finding it only now! You're in my reader now girlie!